We have been revisiting the classic story of the Enormous Turnip and re-writing it concisely (trying not to spend too much time on each animal being called over to help with the turnip pulling!). We then went on to produce wonderful large observational pastel turnips using a blending technique to merge the shades of colours. We ended the week with a wonderful trip to Wakehurst Place which we will tell you all about next week! In our IT we extended our work with the Beebots and designed obstacle courses for the robot to follow using our knowledge of left and right. We also used floor maps to find our way around a track and visited different shops. 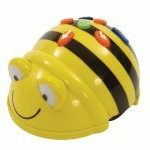 Very busy Beebots!